Festive musical runs Nov. 21 through Dec. 23 at Broadway Rose Theatre Company in Tigard. 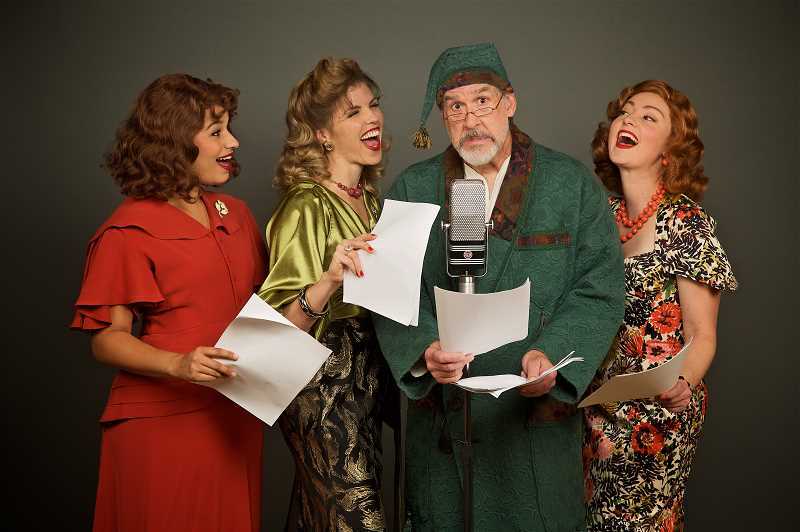 Broadway Rose Theatre Company concludes its 2018 Season of Irresistible Fun with "A 1940s Radio Christmas Carol," at the Broadway Rose New Stage, 12850 S.W. Grant Ave., Tigard. Preview performance is Wednesday, Nov. 21 with opening night Friday, Nov. 23. Performances continue through Dec. 23 with 7:30 p.m. performances Thursday through Saturday and 2 p.m. matinees on select Saturdays and Sundays. Tickets are priced from $30 to $48 for adults; $20 for ages 6 through 18 and $25 for those ages 19 through 30. For a full listing of show performances and to order tickets visit broadwayrose.org or call the box office at 503-620-5262. The story takes audience members back in time on Christmas Eve 1943, as the Feddington Players present "A Christmas Carol" live on-air. After an endless stream of interruptions, technical mishaps and theatrical missteps threaten to tank the broadcast, the company improvises a film noir spin on the classic Dickens tale. Sprinkled with swing arrangements of Christmas standards and original songs in the period style, "A 1940s Radio Christmas Carol" is the festive comedy to sweeten your holiday season. Director and choreographer Dan Murphy notes that the musical is set against the backdrop of WWII, a particularly difficult time in our nation's history. "No doubt the beautiful music and storytelling magic of a radio drama broadcast offered people a respite from the news of the day and gave families a chance to gather together," said Murphy. "I hope this show does the same for you, so that whatever you are celebrating this holiday season you're able to create the memories you can look back on fondly years from now." The cast includes Tim Blough, Jeffrey Childs, Jared Mack, Sarah Maines, Shawn Rogers, William Shindler, Jade Tate, Joe Thessen, Malia Tippets and Jackson Wells.